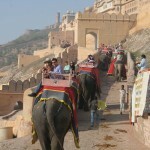 Come March and tourists head in droves to catch the Elephant Festival in Jaipur. We were among those tourists. Jaipur is a princely city of Rajasthan which takes immense pride in its famous Elephant Festival which is celebrated in March during the festival of colors, Holi. In keeping with the tradition of traveling frequently, I along with my friends reached Jaipur one day before the festival. We were booked in the heritage hotel Alsisar Haveli, which is a wonderful hotel. 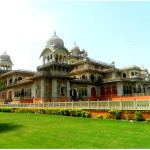 After seeing this hotel it would be no exaggeration to say that we had traveled back in time to the era of raja-maharajas. The royal treatment was overwhelming and something which I will remember for long. During the celebration of Elephant Festival, the Pink city of Jaipur gets transformed in to a “famous venue” as tourists from far and wide come here to witness the charm of the colorful and royal Elephant Festival. It is the most popular festival which is celebrated with great pomp and show in the princely city. Dedicated to Elephants, this festival recreates the royal splendor of the raja-maharaja era. 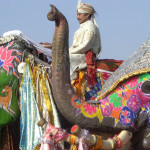 Jaipur’s Elephant Festival is organized by Rajasthan Tourism every year. On our way to the festival venue our guide Sukhvinder Singh said with strong conviction that we will surely enjoy the festival which is marked by elephant parade, polo match, tug of war, elephant beauty contest, folk dances and many more events. As we entered the stadium we saw it was fully packed with visitors and tourists who had come to see this festival. The morning of this eventful day was marked by the procession of the breathtakingly decorated elephants in the Chaugan Stadium. Other animals like horses, cows and camels later joined the elephants in the parade. The music band was playing drums and elephants were marching royally. I was feeling as if we had stepped back in time to the era of raja-maharajas. The scene was perfectly royal. And then we treated our senses with wonderful folk dance performances. It was very uplifting. Everybody seemed to be in high spirits. After the long procession ended, the exciting tug of war began. I found this session the most interesting as this war was between a female elephant and 18 tourists. I think it was not fair as the female elephant had to fight alone against 18 people. But this royal creature dragged the tourists and finally won. I was so happy to see that as I was on the side of this majestic creature. People, no offense please. I asked our guide how and when do the tourists sign up for this event. He said that one needs to apply for this 2-3 months before the festival and then around 18 tourists are selected from around the world. Next event was the elephant polo match between two teams of Jaipur. In this match each elephant was controlled by a mahout who sat on the neck and the players sat on the back with a long stick to hit the polo ball. Well it was quite interesting. It was something unusual which we rarely get to see. Now this last event was another session of the festival which I liked a lot. 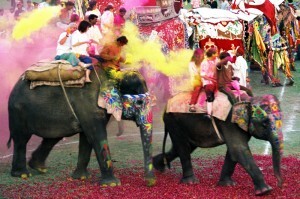 Holi on elephants! Sounds too exciting na! We sat on elephant’s back and threw powdered colors on the people below who were also busy playing with colors with each other. This day was full of fun, excitement and entertainment. It was one of the best trips of my life.